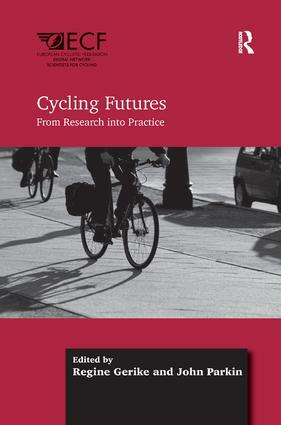 Pointing the way to the future of research and development in relation to cycling as a mode of transport, this book investigates some of the significant recent developments in the technology, provision for, and take up of cycling in various parts of the world. Tensions at the heart of the nature of cycling remain: on the one hand cycling is frequently viewed as being a risky activity, while on the other hand it is seen as being a way of allowing populations to live healthier lives. Reviewing this dichotomy, the authors in this book consider the ways that cycling is planned and promoted. This is done partly in relation to these issues of risk and health, but also from the broader perspective of behavioural response to the changing nature of cycling. A section on methodologies is also included which outlines the current state-of-the art and points a way to future research. Contents: Foreword, Bernhard Ensink; Preface, Manfred Neun; Introduction: philosophy and structure of this book, Regine Gerike and John Parkin. Part I Health and Safety: Cycling for transport, physical activity and health: what about pedelecs?, Bas de Geus and Ingrid Hendriksen; Cycling behaviour and accident risk of utilitarian cyclists in Belgium, Bart Degraeuwe, Bas de Geus, Isabelle Thomas, Gregory Vandenbulcke, Romain Meeusen and Luc Int Panis; Exposure to particulate matter in traffic when cycling, Hanny Willems, Bart Degraeuwe, Bas de Geus, Nico Bleux, Gregory Vandenbulcke, Isabelle Thomas, Romain Meeusen and Luc Int Panis; The connection between cycling safety and volume, Terhi Luukkonen and Kalle Vaismaa. Part II Planning and Promotion: Learning from positive examples of cycling promotion: separation or integration in Munich's transport policy?, Chelsea Tschoerner; Strategic planning of bicycle networks as part of an integrated approach, Regine Gerike and Peter Jones; Challenges in reducing bicycle casualties with high volume cycle use: lessons from the Netherlands, Divera A.M. Twisk, Ragnhild J. Davidse and Paul Schepers; Designing safe intersections: determinants of accidents involving cyclists and turning vehicles and strategies for their reduction, Marcel Schreiber, Jorg Ortlepp, Petra Butterwegge and Tina Gehlert; The use of social marketing in promoting cycling, Alan Tapp and John Parkin. Part III Methodologies: Cycling and active mobility - establishing a third pillar of transport policy, Martin Held, Jorg Schindler and Todd Litman; Assessing the physical environment related to cycling and walking, Ariane Ghekiere, Griet Vanwolleghem, Jelle Van Cauwenberg, Greet Cardon and Benedicte Deforche; Measuring customer satisfaction in bicycle planning and policy: the ADFC 'bicycle climate test', Thomas Bohmer; Using bikeshare datasets to improve urban cycling experience and research urban cycling behaviour, Roger Beecham. Index. Regine Gerike is head of the Chair of Integrated Transport Planning and Traffic Engineering at TU Dresden, Germany, John Parkin is Professor of Transport Engineering at the University of the West of England, UK.